How IC L293D runs a motor? Home » Electronics » How IC L293D runs a motor? 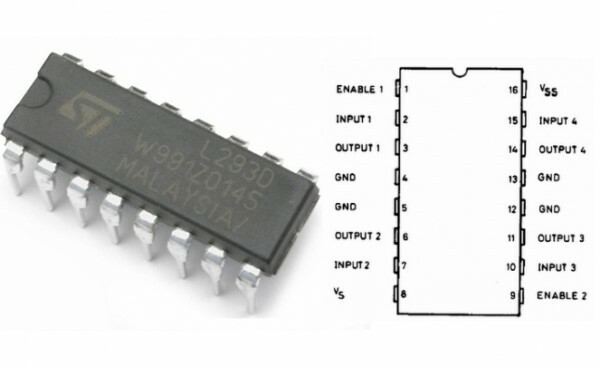 IC L293D is a 16 pin motor-driver IC that replicates the basic concept of a transistor. It is built-in with two H-bridge driver circuits to drive two DC motors simultaneously. One of the greatest advantages is that it can run the motor in both directions: clockwise and anti-clockwise. The L293D is designed to provide bidirectional current up to 600 mA, and the voltages from 4.5 v to 36 v.
In this L293D, there are two enable pins (pin 1 & pin 9) for activating the IC. When the ENABLE pin 1 is high, the left part of IC will work, if it is low it will not work. Same condition applies to ENABLE pin 9 in which the right part of IC will work. And there are 4 input pins and 4 output pins in this IC. The 4 input pins are 2, 7, 10 & 15. Pin 2 & 7 are in the left hand side and pin 10 & 15 are in the right hand side. Left side pins will regulate the motor connected across the left motor, and the right side pins will regulate the motor connected across the right motor. And the 4 output pins are 3, 6, 11 & 14, these output pins are connected to the motors respectively. The pins 4, 5, 12 & 13 are ground pins. The pin 8 will go to Vcc, which will be supplied to the motor, and pin 16 will go to Vss that is supplied to the IC. 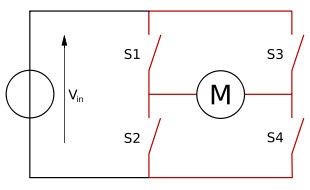 H-bridge is an electronic circuit. It allows a voltage when the load is applied across on the either direction of a circuit. The term ‘H-bridge’ is derived from the schematic of four switches (S1, S2, S3, & S4) connected with a DC motor. The motor will run only on the basis of inputs provided across the four switches. Check the below tabular column to know how H-bridge enables a motor? IC L293D is a cost-efficient electronic device, which is quite often used in robotic applications to run two DC motors on both forward and reverse directions. Other motor-driver IC’s similar to L293D are L298 & ULN2003. IC L298 is quite costly, while IC ULN2003 does not have a H-bridge circuit to run the motor on any directions. Overall, IC L293D is the best motor-driver IC for small applications.